Employed persons at work and members of the Armed Forces not sick, on leave, etc. The definitions and explanations set forth here should be interpreted in the context of the 1960 Censuses, in which data were collected by a combination of self-enumeration, direct interview, and observation by the enumerator. Some of the definitions used in 1960, apart from the main subjects of place of work and means of transportation to work, differ from those used in 1950. These changes were made after consultation with users of census data in order to improve the statistics, even though it was recognized that comparability would be affected. Statistics in this report are presented for the working population which consists of persons employed and at work and members of the Armed Forces not sick, on leave, etc. Data on journey to work relate to the calendar week prior to the date of enumeration. This week is not the same for all respondents because not all persons were enumerated during the same week. Employed persons at work comprise all civilians 14 years old and. over who were "at work" those who did any work for pay or profit, or worked without pay for 15 hours or more on a family farm or in a family business. Members of the Armed Forces "... not sick, on leave, etc." consists of persons on active duty with the United States Army, Air Force, Navy, Marine Corps, or Coast Guard except those in an absence status. Data shown on occupation and industry, however, exclude members of the Armed Forces and thus are directly comparable with data on "employed persons, at work" as shown in other census reports. This refers to the geographic location in which workers carried out their occupational or job activities. For the purposes of this report, locations of place of residence and place of work are, generally, in terms of specific areas of the following kinds: (1) Central cities of standard metropolitan statistical areas, (2) other cities of 50,000 or more, (3) counties with no separately identified, cities or towns, and (If) remainder of counties, in counties with separately identified cities or towns. Persons working at more than one job were asked to report on the job at which they worked the greatest number of hours during the reference week. Salesmen, deliverymen, and others who work in several places each week were requested to name the place in which they began work each day, if they reported to central headquarters. In cases in which daily work was not begun at a central place each day, the person was asked to report the county in which he had worked tile greatest number of hours during the previous week. This refers to the principal mode of travel or type of conveyance used by workers in traveling to and from world by civilians at work during the reference week and Armed Forces personnel (except those on leave, sick, etc.). The enumerator was instructed that "principal means" referred to the means of transportation covering the greatest distance, if more than one means was used in daily travel, or to the means of transportation used most frequently, if different means were used on different days. He was further instructed that "railroad" was defined to include commuter and other regular trains operated by railroads, whereas "subway or elevated" was meant to refer to a rapid transit system operating on its own right-of-way. "Bus or streetcar" was defined as referring to public vehicles operating within or between cities on public streets or highways. The term "public transportation" is applied to a combination of schedule entries on means of transportation and is comprised of "railroad," "subway or elected," and "bus or streetcar." 1.Each city of 50,000 or more (including cities that were expected to achieve this size by 1960). 2.Each central city of a standard metropolitan statistical area not included in 1 above. 3.In conterminous United States, except for Connecticut, Massachusetts, Rhode Island, and the densely settled portions of Maine and New Hampshire, counties, or their remainders in cases where the counties contain separately identified place-of-work areas. In the excepted areas in New England, quasi-counties, comprised of segments of counties resulting from the superimposing of SMSA boundaries, stand in the stead of counties. 4.Incorporated places of 5,000 or more and election districts (or their remainders) in Alaska, and census county divisions in Hawaii. In this report the records of workers were assembled by geographic unit of residence and by geographic unit of place of work; where the number of workers residing in one area and working in that area or any other was 50 or greater, that "stream" of workers is shown in table 1 provided, of course, that either residence or place of work, or both, was located in an SMSA of 250,000 or more. The "50-worker rule" applies to streams between specific geographic units, between a geographic unit and a county, geographic unit and an SMSA, and between a county and an SMSA. Thus, data nay be shown for the stream with 50 or more workers commuting between an SMSA and a county outside the SMSA, although no separate figures are shown for the components of the county in. relation to the SMSA because each substream contains less than 50. In the table 1 presentation for an SMSA, for areas within the SMSA, the "rule of 50" does not apply; that is, all streams among units within the SMSA are shown. In viewing statistics for the streams for a given SMSA, it should be noted that the category "remainder of county" as a place of work or of residence outside that SMSA refers to a specific area and is not a residual category. For example, in the presentation for the Davenport-Rock Island-Moline, Iowa-Ill., SMSA, workers are reported as working in the SMSA and as residing in Cook County, Illinois. Note, however, that the following subdivisions of Cook County shown are "Chicago city," with 54 workers, and "Remainder of county," with 68 workers, the sum of which is only122. Cook County in which fewer than 50 workers reside who work in the SMSA in question and are not separately shown apart from the total from Cook County. In Connecticut, Massachusetts, and Rhode Island, as well as in the densely settled portions of Maine and New Hampshire, further variations of places of work and places of residence are encountered. Identification of place of work (or residence) may be in terms of expressions such as "Fairfield County, non-metropolitan part" or "Bridgeport metropolitan part, Fairfield County." These descriptive titles refer to quasi-counties and Indicate whether or not the unit is within an SMSA. These quasi-counties are fully identified by city and town composition in Appendix B. The reading of table 1 may be simplified by an illustration. For the Davenport-Rock Island-Moline, Iowa-Ill., SMSA, "residing in SMSA, all workers," shows 101,535 workers who are living in the SMSA, 72,748 of whom use "private automobile or carpool" as means of transportation to work. There are, then, 101,535 workers who live inside that SMSA apart from any consideration of where they work. The second data line, "working in SMSA," denotes the number of persons who both live and work within the SMSA. There are 101,535 workers living in the SMSA, of whom 95,138 also work in-the SMSA. The following seven lines show the breakdown of this group of 95,138 by location of place of work for each of the geographic units found within the SMSA. Continuing down the listing for the Davenport- Rock Island-Moline, Iowa-Ill., SMSA, the last subcategory for "working outside SMSA" is "elsewhere," a residual which contains the count of workers in streams not meeting the "50 or more" requirement. Then, the "not reported" category includes all those who were classified as "workers" in the census but for whom information on place of work was insufficient for the purposes of coding or was not reported. The following blocks of data proceed upon the same pattern as the first two: For each geographic component of the SMSA a presentation is provided which shows the locations of places of work for workers who are residents of the geographic unit and the locations of places of residence for workers who reported the unit as their place of work. 1For areas in Connecticut, Maine, Massachusetts, New Hampshire, and Rhode Island, see Appendix B. 2Areas outside the United States are occasionally designated "by residual entries such as "Other West Indies, " and "Other Pacific Islands." See Appendix C.
3Although this report presents data on the number of persons living in, for example, Buffalo, N.Y., and working in Canada, no information on persons living in Canada and working in Buffalo is available. Selected characteristics of workers living or working in SMSA's of 250,000 or more are presented in table 2. In contrast to the specific streams of workers shown in the first table, the presentation in table 2 is in the form of generalized streams of workers among components of each SMSA and between SMSA components and areas outside the SMSA. The locations of residence and place of work presented for each SMSA are by central city or ring of the SMSA and outside the SMSA, distinguishing among same and different counties and among central cities, for those SMSA's with more than one central city. Workers living (or working) outside the SMSA are classified as to location in a county of residence (or county of work) contiguous or noncontiguous to the county of work (or county of residence) and, for contiguous counties, whether the county is in another SMSA (metropolitan) or not (nonmetropolitan). A reference list of counties outside each SMSA which are contiguous to counties in SMSA's of 250,000 or more by metropolitan status is presented in Appendix D.
During the tabulation of statistics on place of work, it was discovered that some enumerators working in counties containing central cities of SMSA's, but outside the cities themselves, had failed to identify correctly these central cities as places of work. 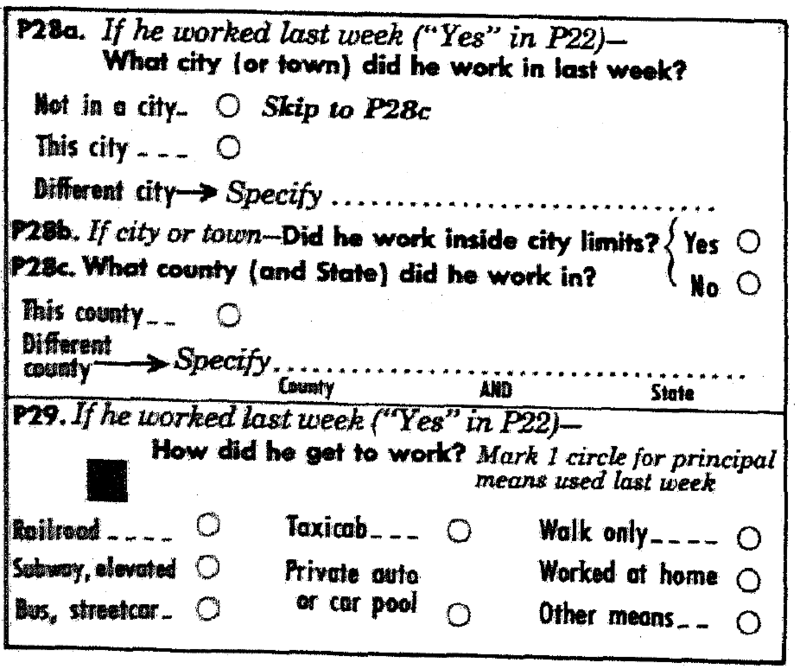 For the convenience of the enumerator and the coder, the F0SDIC document contained a circle labeled "this city" for indicating that the place of work was in the respondent's city or town of residence. Some enumerators understood this category to refer to a nearby large city and filled the circle when they should have written in the name of that city in P28a. Since the city that actually contained the place of work was frequently a central city of an SMSA, the original data for both tables 1 and 2 were impaired. Later, a national sample of reports of place of work was assembled for the purposes of estimating the magnitude of the error before and after the corrective edit. On a national basis, excluding from consideration the New England States and New Jersey, it appears that the published statistics are substantially better than would have been the case had the corrective edit been omitted. The number of workers residing outside central cities in the balances of central counties and working in the central cities appeared to "be considerably understated before the correction and only slightly overstated, in net effect, after the correction. For workers living in incorporated places within central counties or, in Pennsylvania, in urban townships within central counties, there still remains a small understatement of the number of persons whose place of work was in the central city. Moreover, it is probable that there is also some understatement of commuting to central cities from outside the central counties. It was not feasible to estimate the error or take corrective action for these more distant areas. Therefore, it cannot be readily determined whether the total number of commuters to central cities of SMSA's is overstated or understated in the published statistics. It became apparent during the preparation of statistics for chapter D of Volume I that In a few instances, notably Armed Forces installations, appreciable numbers of reports of place of work: in the central city were found among persons living in the ring of SMSA's who had specified, in the means of transportation inquiry, that they "worked at home. " On the whole, it is probable that the inconsistencies arose in the incorrect assignment of place of "work by the above-described edit to the central city. Although it was not possible to consider re tabulation of these data to correct this error, the tabular inconsistencies were removed by assigning the cases to the means-of-transportation category of "not reported" in chapter D. In the present report, a departure from the treatment of statistics on place of work in Volume I has permitted the correction of this error at the expense of generating differences in comparable figures found in the Volume I reports, particularly in those areas with large military installations. Specifically, the place of work of workers reporting that they worked "at home" in response to the question on means of transportation to work was allocated to the geographic unit of residence regardless of Inconsistent or missing information on place of work. For this reason, then, data presented here depart in different ways from statistics shown in chapter C of Volume I and in the census tract reports on the one hand, and from chapter D, Volume I, on the other. 4In chapter C and In the census tract reports, the discrepancy was not recognized, while in chapter D such discrepancies were reconciled as noted above, by showing means of transportation as "not reported." Statistics shown for SMSA's in New England differ from comparable figures appearing in the census tract reports and in Volume I, chapters C and D. These differences reflect corrections in the distribution of reports on place of work which were not sufficiently specific as to location to permit assembly of data by the quasi-county areas described above. The number of workers shown as "not reported" as to place of work has been increased and the number shown as working outside the SMSA of residence shows a compensating decrease. However, the statistics for areas involved in this modification appear in separately listed categories following the "not reported" data lines in table 1. The number shown in table 1 for the group of workers "residing in Boston city" who were working in Boston is 216,361. This number should be identical to the number shown for the group who were "working in Boston city" and residing in Boston. However, the figure shown in the latter presentation, 216,180, is 181 short of the correct figure found in the former. For each such inconsistency, statistics shown in the "Residing in..." blocks are correct while the corresponding statistics shown in the "Working in ...blocks are incorrect. Similarly, any discrepancies between statistics shown in the "Residing in ..." blocks in table 1 and the figures derived from corresponding detail in table 2 are attributable to errors in table 2. Carrying out the Boston example, table 2 shows 216,180 workers living and working in the. central city of the Boston, Mass., SMSA, as contrasted with the correct figure of 216,361, referred to above, in the block of data in table 1 entitled, "Residing in Boston city." 4See the list of corrections in the State parts of Volume I for further details. The median is presented in connection with the data on earnings. It is the value which divides the distribution into two equal parts, one-half the cases falling below this value and one-half the cases exceeding this value. The mean is shown in the presentation on earnings and wage or salary income. It refers to the dollar value which is equal to the aggregate, or the sum, of earnings or of wage and salary incomes, divided by the number of workers with earnings or with wage and salary incomes, respectively, in 1959. All persons who are not members of households are regarded as living in group quarters. Group quarters are living arrangements for institutional Inmates or for other groups containing five or more persons unrelated to the person in charge. Most of the persons in group quarters live In rooming houses, college dormitories, military barracks, or Institutions. Inmates of Institutions are persons for whom care or custody is provided in such places as homes for delinquent or dependent children; homes and schools for the mentally or physically handicapped; places providing specialized medical care for persons with mental disorders, tuberculosis, or other chronic disease; nursing and domiciliary hoses for the aged and dependent; and prisons and jails. a. A child of the head: A son, daughter, stepchild, or adopted child of the head of the household. b. An other relative of the head: A per- son related to the head of the household by blood, marriage, or adoption, but not included specifically in another category. c. A nonrelative of the head: Any member of the household who is not related to the household head. This category includes lodgers (roomers and partners, relatives of such persons, and foster children) and resident employees (maids, hired fart hands, etc.). The data on occupation and industry in this report are for employed persons who were at work during the census week and refer to the job held during the week for which employment status was reported. For persons employed at two or more jobs, the data refer to the job at which the person worked the greatest number of hours. The occupation and industry statistics presented here are based on the detailed systems developed for the 1960 Census; see 1960 Census of Population, Classified Index of Occupations and Industries, U.S. Government Printing Office, Washington, D.C., 1960. Information on income for the calendar year 1959 was requested from persons 14 years old and over. Earnings are obtained by summing wage or salary income and self-employment income. Wage or salary income is defined as the total money earnings received for work performed as an employee. It represents the amount received before deductions for personal income taxes, Social Security, bond purchases, union dues, etc. Self-employment income is defined as net money income (gross receipts minus operating expenses) from a business, farm, or professional enterprise in which the person was engaged on his own account.